The Sturmartillerie was a key part of Germany's armoured arsenal throughout World War II. Its armoured assault guns were designed to support the artillery on the battlefield, largely using the purpose-built Sturmgeschutz infantry support gun. This new and exhaustive study details the development and operational history of this innovative force, as well as describing how its role and the tactics it employed changed from the glory years of Blitzkrieg through to the desperate defence of the last years of the war. It also describes the technical development and evolution of the vehicles employed, and includes combat action reports and excerpts from interviews with veterans. A German national, Thomas Anderson is a specialist in the German Armoured Fighting Vehicle of World War II. He has spent decades trawling the archives throughout Germany and the rest of Europe to discover little-known facts and never previously published photographs of the might of the Blitzkrieg. A modeller, he regularly contributes to popular modelling and historical magazines across the globe including Military Modelcraft International (UK), Steel Art (Italy), Historia Militar (Spain) and Batailles & Blindes (France) as well as many others. 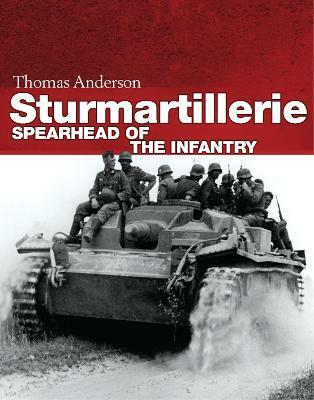 He has previously published a three-volume history of Sturmartillerie/Sturmgeschutz in German which is due for release in English in the next year.